You may lost text sound notifications with incoming texts alerting you with a sound whenever you receive a text. This article explains what to do when your idevice is not making any sounds when you get a new message. 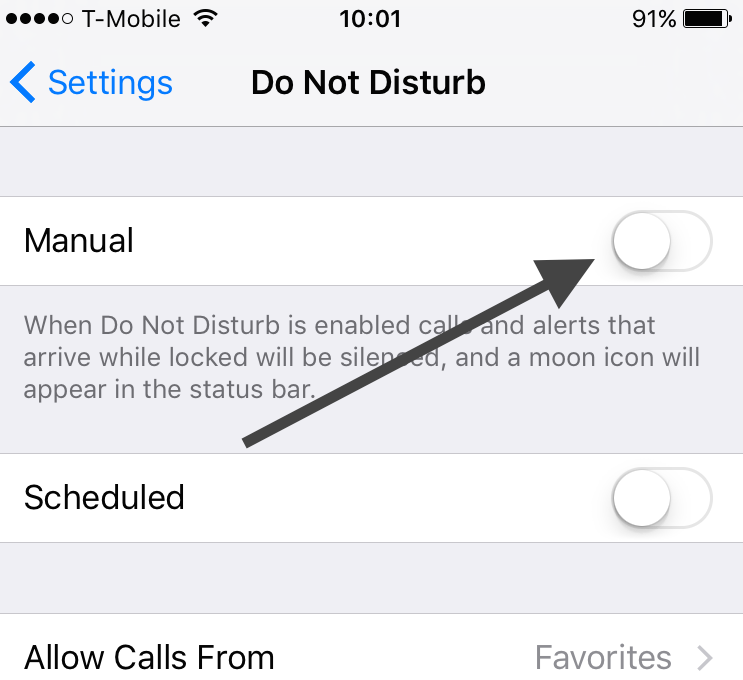 1-Make sure that you do not have Do Not Disturb turned on. You may check this by going to Settings > Do Not Disturb. Set this to “Off”. 3-Tap Settings > Notifications > Messages, make sure that “Allow Notifications” is turned on. Make sure that the mute button isn’t turned on by pushing the “Ring/Silent” switch to the “Ring” position. 5-Restart your device by pressing and holding the sleep/wake button until you see the slider then slide the slider. 6-Reset your device by holding down the home button and the power button (wake/sleep) until you see the Apple logo. 7-Restart the Messages app. You can force the Messages app to close. Simply press the home button twice, find the Messages app and swipe up to close it. Then relaunch again. If you do not see the contact names, see this article. Wow, I had no idea we could silence individual people. I must have bumped Do Not Disturb while looking at old pics. This was driving me nuts, and your info helped me set it right. Thank you for posting this solution! I had not idea about a Ring/Silent button. It seems I occasionally have pushed it to Silent and stopped receiving any Notification sounds. Thanks a lot! I deleted all my messages and the notifications automagically started again! Who knew? Your suggestion is the one that worked for me. Many thanks! Thank you, Gatito, this worked when all else failed. Greatly appreciated! THANK YOU! I have been working on this for a couple of hours this is what finally worked. My son was not getting notifications from me but was from everyone else. I thought maybe it was because I had an android. All the settings and DND were fine, I did a hard reset. I tried everything I could find in every forum! All I had to do was delete the texts from me, send a new text and then it worked! Thanks! My silence button was flipped on. I have been having trouble with no audio notifications when an e-mail came in. I discovered that under Do Not Disturb that SILENCE: at the bottom has two settings 1) Always & 2) Only while iPhone is locked. Once I switched from Only while iPhone is locked to Always my audio notifications returned when receiving incoming e-mails. Hopefully, this might help someone as it drove me crazy for weeks. That is the ONLY thing that solved the problem for me! None of the other items were an issue .. it is mind boggling as the explanation behind ALWAYS and when phone is locked completely does not make sense!! So setting it up to ALWAYS restored the darn sound! Unreal. My message sound notifications was not working with the Only while iPhone is locked was checked. Very unusual to receive calls and notifications with Always checked. Thanks although when checking “Always” it states Incoming calls and notifications will be silenced while IPhone is either locked or unlocked. That sure sounds like silenced all the time.?? I do have the end manual setting disabled though, so Ill try it. This worked! Thank you so much! I had seen the “always” but didn’t want to try that, as I don’t always want my notifications silenced. Thank you for posting this fix! My daughter helped me out after numerous attempts on my own. My wife called me and when the call was visually showing up on my phone she set the upper left switch to silent and then back to audible. This then resactivated all of the audible “signals”. We had the same problem.Thank you! This worked! imagining things because I heard other people’s texts and other sounds like calls. I thought, “Okay, you’re just senile.’ I wasn’t crazy!! Thank goodness! My iPhone 6s (ios 9.3.4) alert sound not working some times. It rings onetime, but some times not. i have checked for any do not disturb on, silent button on and alert volume adjustment, but everything fine. The funny thing is, some times alert sound high volume other time reduced volume for same alert,but some time no sound??..!! is it the os bug? Don’t know if you or others still have this problem, but I struggled with this same issue for two months and solved it today. If your text alert sound is longer than a single “ding”, then if the sender leaves his message right after sending his text, you will not get an alert sound. Keep the sound to a single ding of some sort and you’ll get the alert. Got my new iPhone 7. Messages sometimes ding, but most of the time don’t. Annoys the hell out of me. Checked and rechecked all the settings- still not luck. Shall I replace the phone? See my reply to Rajiv above. I had this identical problem, Apple reset my phone twice, checked all settings, etc They couldn’t solve it. Solution? Simply use the default text tone “ding” rather than longer alert tones. If you have a longer alert, and the sender exits messages quickly, you will not get a tone. I tested it and it solves the problem. Having same problem, did u rectify? I have the same issue – it happened right after I updated phone with iOS 10. Have checked all settings and tried recommended fix with no success ?. That’s where I’m at too! Very frustrating. The little mute switch on the side of the phone was the issue for me!! Learn something new everyday! Woo Hoo! Have the same issue. No sound when I bought Yuda alert from App Store. So I paid for the tone and it doesn’t work! Nothing helps. So my next step is for sure Samsung No more iPhone iPad stuff. Not too bad but expensive and non reliable. My iPad Air is ok. But iPod 1 has no apps supporting this good device. I have tried all options, none work. Forcing texts closed has now deleted all my text history. My no sound w texts was resolved when I went to.settings/sounds and turned up the volume for alerts to full volume. I had it on about 80% and the volume button on the side turned down a little bit too. Thank you, thank you, thank you! It’s been driving me crazy because I KNEW it sound before….. Turning off bluetooth worked for me. Seems to be a bug, but this is a fix until Apple steps in. Turning off bluetooth does seem to be a quick fix to the problem. The really annoying thing is that means an Apple Watch can’t stay connected. Scroll through your messages and look to the left side of each name. If you see a crescent moon, you’ve somehow activated do not disturb for that person. Go to edit to turn it off. Thanks to suggestion #2 we solved the problem on an iPad mini! Thank you – that solved it for me!! Thank you!! We have been trying to fix this problem for 300 miles and your answer solved the problem! Have an iPad purchased in May of 2016. I recently updated it and believe that somehow stopped all notification sounds. I have tried each solution in every support site and nothing works. Very frustrating! Awesome, great job with results that worked. My problem was not with my iphone, just my ipad. I just figured out what my problem was. In ‘settings’ the ‘notifications’ for ‘messages’ was disabled. I turned that on, and now I have sound when I get a text message. Wow!!! Never knew what that 1/2 moon next to a text meant…so small I thought it was a spec of dust. exactly! nothing else worked except turning the blue tooth off. it must be a bug. turning bluetooth off fixed it for me too. Nothing worked until I turned off Bluetooth and then the message tone started working again.. I was connected to my stereo receiver, with no music playing, but that must silence notifications. Turning off bluetooth worked for me. Have no clue why. I also have an apple watch and when I turned of bluetooth on my phone, the apple symbol came on my phone for a while as if to say, why did you turn off bluetooth on the phone. But i left it turned off and the phone and watch worked fine inspire of the bluetooth turned off. A big thanks from an android to iPhone7 migrant! Wow! Many Thanks! I must have silenced my wife s phone! Big mistake!!! Thanks. Thanks for your help… The sound going out may seem so easy to fix to some people, but it really isn’t. I use android for personal use, but my work provides a Iphone!!! Who knew they would offer 1000 ways to silence your phone!!!! My notifications being off means not working. Again, thank you. My exact same situation Amanda – Androids are so much easier to maneuver!! This tutorial helped me so much and sounds like it helped you too! I turned off my blue tooth and turned back on and i started receiving text sounds. Do t know what that has to do with it and I’m not happy about having to do it OR how long it will last. This is the first website that has pointed out the individual ‘do not disturb sign’ to me after months of frustration and random alerts. I’ve used iPhone for years and was fed up of the ‘check you’re not on mute’ or ‘ have you tried turning it off and on again’! Thank you! I inadvertently hit the “mute” switch when taking my phone out of it’s case the other and didn’t realize it. I do now! Thanks for the heads up! This switch is hidden on my Otterbox case and I must have hit it when I removed the case to clean it.. Since I put the case back on I never would have discovered the cause had it not been for your much appreciated advice. My alerts are not coming through when my phone is in sleep mode. I made sure the Do Not Disturb feature was not on (I use that feature a lot when traveling internationally so alerts don’t come through during the night, so I’m very familiar with that feature). I also know the “silent” feature, so neither of those are impacting the lack of alerts. I tried the DND “silence” feature and when I changed it to “always” no alerts came through. So, any other recommendations? Okay, I found one message that suggested turning off Bluetooth, which I just did and now the alerts are coming through. But, I also have an Apple Watch, so now they won’t sync!! Any other suggestions? I also could no longer get a sound when I deceived an iMessage on my iPad Air2. Most of the comments referred to checking the mute button on the iPhone. I found the mute button on the iPad when I swiped up the Notification Center at the bottom of the screen and noticed one of the choices was a bell with a line through it. — the notification sound was muted. So I unmuted it and now I have sound alerts. None of the other suggestions worked for me until I found this little red bell. Oh my god. I was going through my grandmother’s tablet and this solved my problem. She must have been accidentally touching this mute button when she swipes. So stupid that there’s so many ways to mute an iPad. Thank you! Turned off bluetooth. Now works. I had notifications turned on for my FitBit app. Maybe that was why it would not sound? Hi, my iPhone 7 is still receiving text notification sounds, even when the mute tab is switched off on the side. While I’m sleeping, I hate hearing notification sounds so I always mute it. Why am I still hearing these, when it is supposed to be scilenced. Thanks! I have read all these posts, and I still don’t have any sound on my iPad Air 2.
was totally wondering why I had a moon icon at the top of my screen. I must have inadvertently turned on the do not disturb, except that I haven’t been in my settings since before this started, but it’s fixed now. Just submitted a bug report to Apple on this issue. I believe that this isn’t just some random setting problem, since I hear several notification sounds when I get one after some time of not getting any notification sounds with the corresponding text message. Apparently iOS is queuing up notification sounds (they aren’t just lost) and the ones that I don’t hear when the text comes in are queued but not delivered until later. I’m hoping that they can fix this soon, tired of checking my phone to see if I have a text message waiting. Thanks for posting this solution. It was the ‘Do Not Disturb’ feature that was on. Don’t know how I did that. SILENCE! (button) I KEEEL YOU!! Awww man, you’re awesome! I received my iPhone 5 from a relative when my Android died and I’ve had to kind of figure out everything on my own. Hello little ring/silent switch that NO ONE told me to check! You wouldn’t believe how many people I asked about having no notification sounds, how many settings I changed and not one person told me about that one little switch! Thanks a million! Hallelujah!! Thank you, that was driving me nuts! I had no idea it existed. Thank you for restoring my sanity ? None of these suggestions worked for me – I was not getting any sounds on my iPad Pro for texts or emails. There is no silence button on the side of the iPad but I finally found that when I swiped up, there is a bell symbol – this is the mute button and it was on. Once I clicked that and turned the mute button off, I got my sounds back! I’ve tried all the above suggestions on my SE. Purchased new in box eBay less than 1 yr ago. All sound notifications worked until approx. 6 months ago and before updating OS. No change after OS update 2 weeks ago. Phone rings (trill sound) for incoming calls. When I go to the sounds selections none will make a noise like they used to do before. This is my 3rd iPhone but have just about fed up with all the problems over the years. Brilliant and simple! The manual Do not Disturb button had been turned on. Thank you for the VERY clear instructions. You should be writing the Apple manual! None of these solutions helped me. I’m using iOS 10.3.3. I fixed my problem by going to the contact that was sending me texts (with no sound) and I changed the text sound to the ding, then back to their normal sound. That fixed it. Just reassigning the sound a couple times. I am having a problem with not getting text notifications – some of the time. DO NOT DISTURB settings all look good and none of my contacts have the “moon”. I have looked at the things mentioned here, tried them – doesn’t change it. Happens sometimes when the phone is locked, but not always when the phone is locked. Very frustrating. My husband thinks I am just ignoring him – except he is finally sitting here while I try things and he is seeing it happen. But can be very awkward when someone answers a text a few minutes later and I don’t get a notification and don’t notice . . . I don’t know how happened ( do not disturb turned on ) thanks for the corrective solution. For me, they were not working. This may start off like any of the other suggestions but trust me try this! Go to settings > notification center > find Messages > make sure that notifications are ON! I don’t know how, but notifications were turned off for my phone and I had to manually turn it back on! Very important!! Thank you SO much, the basic ding thing worked on my iphone 6s+. Thank you. It was on mute. I had no idea about DND icon,think I might turned it on by mistake!LoL. This was the only reason for 3 days straight i get pissed and i missed all the messages and i get to give them response really late. I found that in my Do Not Disturb that my setting was on manual. Once I toggled it off the text tones worked in the locked screen and whenever there is incoming message and notifications now i seen the light and sound on my screen when its locked. This worked for me. I must have accidentally turned Mute switch on. I might add that your instructions are well presented. many thanks, your suggestions worked well. Tried everything!!!! Checked to see if do not disturb was on, it wasn’t. Reset my network settings, didn’t work. Held home button and Lock screen down till it went on to the Apple logo, didn’t work either. Deleted the contacts number didn’t work so I thought I would delete the whole message conversation thread which I really did not want to do as I had years worth of texts on my iphone but decided to delete it and BAM! My messages are now coming through 🙂 before I wasn’t getting a notification or sound, I had to click on to messages and the message I had received looked like it had steady been open but thanks to me deleting the entire thread it now works!! Figured out my I-pad no sound problem. picture that had accidentally been touched. The bell symbol had turned red with a line through it. Just touching the bell symbol again, turned my sound back on. It was no longer red. I tried all the above suggestions on my 5s and the only thing that works is for me to turn Bluetooth off. This is not an acceptable solution as I use Bluetooth to connect to my car and my Fitbit. Is there a solution?? Very frustrating. I’ve updated to the most recent iOS version 11.2.6. This has been happening for a couple weeks. Bravo! One of your suggestions did the trick. Thank you! Just had the same issue. Asked friends with IPhones for help and called Apple Technical Support. Seeing the above comments and yep, one simple checkmark solved the problem. This message thread saved me a trip to the apple store! Thanks everyone! Thank you very much for this information as it was driving me crazy… as I didn’t know that I could silence it on an individual basis. Very helpful? Wow, I tried every suggestion to get the text notification sound back on a 6s. Finally saw that someone said to turn off bluetooth–I always keep bluetooth off but when I checked it was ON. It must have defaulted to “on” after the last OS update. All is working again. 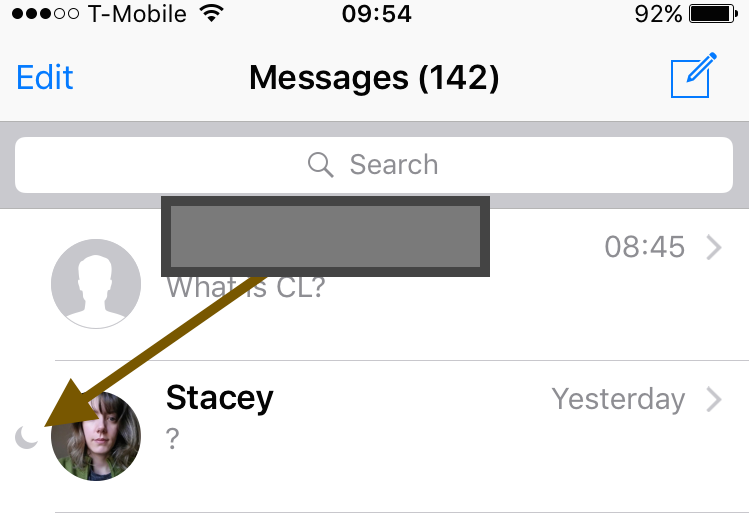 THANK YOU THANK YOU THANK YOU – I had somehow managed to inadvertently turn on both Do Not Disturb and DND for some contacts…doh! Text message from one contact only will not ring or vibrate even after following all of Apple’s instructions. Everyone else in contacts comes through and rings on text and phone. Any suggestions?? So frustrating, my problem was on my iPad, I was not getting any sound on incoming texts, messenger texts and videos and FaceTime. Finally got it going by switching Bluetooth on and off a couple of times. Finally got it going by switching Bluetooth on and off a couple of times. I had already tried do not disturb etc.